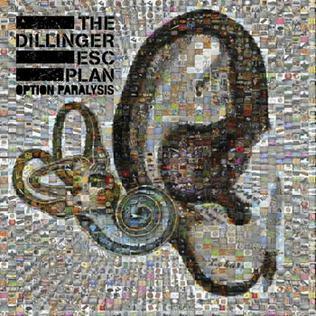 Rock quintet The Dillinger Escape Plan is a well-recognized act from Morris Plains in the northeast United States. They are known for their engaging live performances and interesting use of rhythm. Option Paralysis is their fourth studio release. There is not as much variety on this album, but "Parasitic Twins" and "Widower" are differentially slower tracks. The transition from those to their typical ear-splitting pieces is smooth and the band creates a fresh contrast for anyone willing to keep an open mind towards mathcore and similar genres. The first single, "Farewell, Mona Lisa" was the track that drew my undivided attention to the band, which has had a considerable amount of lineup changes. The album art was done by former lead vocalist Dimitri Minakakis and is a mosaic of the band's own photography. NaNoWriMo word count: 13032 of 50000. The title of this post was inspired partly by DEP, but also by a turn of stressful events that occurred yesterday. I am just grateful that the week is half over and that my conflicts have been absolved.